This Spyderco Endura knife has a flat saber-ground VG-10 stainless steel blade with the Emerson Wave opening feature. The handle is blue/gray FRN. The Endura knife features a molded FRN (fiberglass reinforced nylon) handle with Bi-Directional texturing for traction and improved ergonomics. The handle is strengthened with dual skeletonized stainless steel liners that make an anchor for all external and internal components to attach while adding sturdiness and rigidity. Phosphor bronze bushings on the blade pivot smooth out the open/close action. The pocket clip is four-way reversible for tip-up/down, left- or right-handed carry. 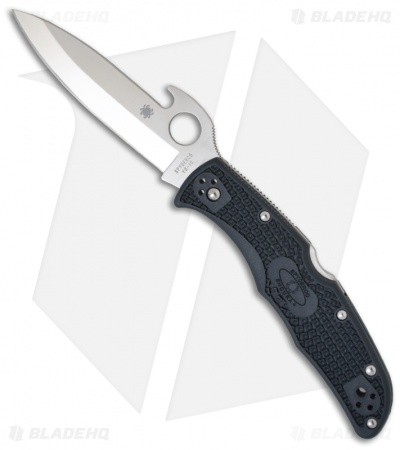 The blade is premium VG-10 stainless steel from Seki-City Japan and has Spyderco's easy to use thumb hole for simple, efficient one-hand opening of use the blade-opening feature made popular and patented by Ernest Emerson of Emerson Knives. The Emerson opening feature is a hook curving out the top of the knife's blade. When removing the knife from a front pocket it catches the pocket's edge quickly opening the knife blade so that it's ready to use. The knife can also be taken out of the pocket without engaging the opening feature by pulling it straight up and out with your fingers on top of the closed blade. Nice knife. Just a bigger version of the Delica. I like this version with the thicker blade more than the thinner blade (flat grind?). Feels better having a little thicker blade stock on such a long blade. Wave feature works great. Can occasionally be a problem if you want to take the knife out without opening it immediately. Just have to be aware of it. I have been carrying this for about 10 years (aproximatly). The endura wave has never let me down. As a police officer, i have used this for many tasks it was never inteded. I have sharpened this so many times it’s nearly due replacing. I have tried other knives and keep coming back to this. The lock has never failed. The blade holds an edge very well. The scales provide very good traction. The wave feature works very well, it also works well as a bottle opener. This was my first spyderco, I have bought several since. The saber grind on the waved version makes it a little nicer for tasks that you may want a slightly stouter blade for such as construction and things that don't require a finer slicing edge. The Endura is a lightweight workhorse. Sleek, fast, and dependable. 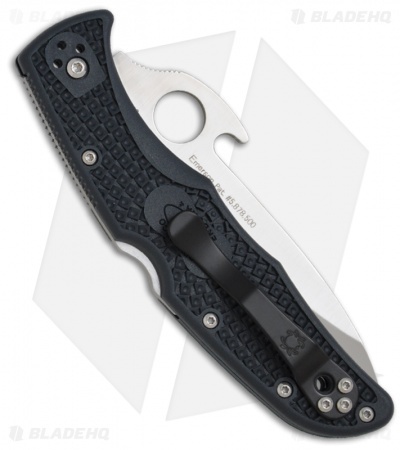 It's also a great entry point for anyone interested in Spyderco knives. Longtime fan of Spyderco and this combo with Emerson makes opening a breeze. Feels secure in the hands with the textured grip and the blade length is ideal for bigger cutting tasks around the office. This is my work edc, very solid overall knife. Not the prettiest blade shape but very effective. Feels great in hand and nice blade size. Same problem as many other spydercos, to much handle sticks out of the pocket. I have always had lock back folders from Spyderco. Now with the addition of the Emerson Wave, it makes it that much easier to operate with either hand. The wave is perfectly cut to allow smooth deployment every time. I had a Fox with a wave that was more rounded and it would often catch one the pocket. My favorite spyderco to date. Once you go emerson/wave opener, you can't go back. I carry this when out in plainclothes, and the quick deployment gives me a great degree of confidence. I've been carrying this knife for four months now and I couldn't be happier. Quick deployment and feels great doing all cutting with it. I added the Wise Men Co. signet ring for a bit of customization and made this knife even more awesome! Light. Thin. Quick one-handed deployment. This knife is everything an EDC should be. It feels great in hand, the jimping is incredibly functional and again that deployment - so good. I bought this after falling in love with the Matriarch 2 with the Emerson Wave, this knife has the same handle so the imprint is virtually the same - except pulling this out in public for some menial task like opening a letter doesn’t raise awkward questions. This won’t be the last knife I buy (because I have a sickness only new knives can cure), but it could easily be the only one I carry everyday for years to come. 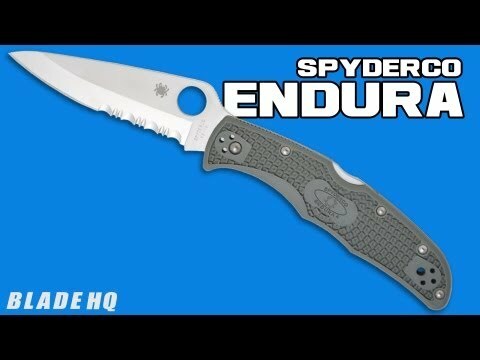 Spyderco an emerson combo! Great construction of spyderco an emerson wave makes this a outstanding EDC. Light my usual dress up knife. personally as far as wet weather tasks/self defense goes with this blade, its one of my favorites. no lock stick and plenty sturdy. this is one of the fastest deploying folders i own. although one thing i wish i could change is the steel, while vg10 is great and has never given me problems i just wish i had something requiring a little less sharpening. although it does take an edge fast and rarely ever takes me more than a couple minutes to do by hand. i also threw on a signet ring and mxggear deep carry clip for it to better suit my needs. This version of the Endura has a unique aesthetic, is highly functional, and the extra blade deployment options are a fun bonus. This knife has seen some rough usage and it had no problems. I am completely satisfied with it and it's a fun alternative to the other Endura's I carry. I've gone from almost hating this knife to loving it. It's broken in nicely and is super sharp. At first the scales felt like cheap plastic, but I've grown to appreciate how "grippy" it is. Not a great edc only because of its blade design, but it's my go to knife on days I cannot Carry a firearm. And the wave feature is so much fun! May be the best EDC for personal protection. The Emerson Wave on this Spydey, and the Delica Wave, is larger than on any Emerson product. The ergonomics are such that reliable auto deploy with an authoritative snap makes this blade like no other. The blade shape and size is better than the standard Endura. Very light weight. High Spydey quality. Great color. Will not disappoint.